Zack Zeller, Victoria Trumbull's city-bred tenant, thinks black trumpet mushrooms are poisonous, so he gives them to Samantha Eberhardt, the girlfriend he's trying to break up with. Black trumpets – also called trumpets of death – aren't poisonous. They're prized by gourmets. But when Samantha turns up dead, Zack is in big, big trouble. Not only is Zack charged with murder, but Bruno Eberhardt, Samantha's rich father, is sure Zack is the culprit and has vowed to avenge his daughter. Meanwhile, arson claims the old parsonage and with it the life of a young Island man. Are the two deaths related? And why does no one but Samantha's father grieve her untimely death? To solve the case, the intrepid Victoria Trumbull must win the confidence of those Samantha led astray, any one of whom could be the murderer. 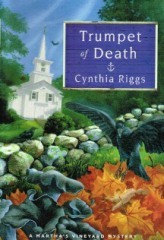 Aside: Mushrooms have surfaced before in the Martha's Vineyard Mystery series, as the murder weapon of choice in Jack in the Pulpit. Dr. Sidney Riggs, Cynthia's father, once attempted to grow edible mushrooms in the basement of Cleaveland House, but the closest Cynthia herself comes is with the tomatoes from her munificent garden. Tomatoes belong to the deadly nightshade family, but deadly they are not.